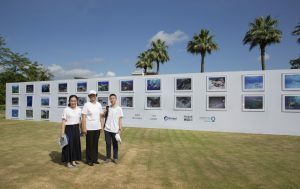 SANYA (May 24, 2018) – China’s Fisheries Resource Management Bureau under the Ministry of Agriculture and Rural Affairs along with several other provincial-level environmental agencies demonstrated their increased support for the protection of sea turtles by inaugurating a 98-member China Sea Turtle Conservation Alliance (CSTCA) in Sanya, China on May 23, 2018, World Sea Turtle Day. Chinese actor LIU Ye was also awarded China celebrity ambassador for Aquatic Wildlife Protection by the National Aquatic Wildlife Conservation Association at the event. Over 250 representatives from the government, media, research institutions, NGOs and academia joined for the event, which also included the release of 5 captured turtles into the ocean with geo-trackers and the destruction of over 40 tons of confiscated illegal marine wildlife products. ZHANG Xianliang, director of the Bureau of Fisheries and Fisheries Law Enforcement (BOFFLE) under Ministry of Agricutlure and Rural Affairs, CUI Lifeng, President of the Chinese Academy of Fishery Sciences, and LI Yanliang, delivered keynote speeches supporting the Sea Turtle Alliance’s efforts to take the protection of Chinese sea turtles a step further. The Alliance will conduct sophisticated research on sea turtle nesting and migration, as well as illegal sea turtle supply chains, and aims to work with the government to ensure better sea turtle conservation and increase the level of protection of sea turtles from a Level 2 to Level 1 protected species. The research and alliance will be co-led by Global Environmental Institute (GEI), a Chinese non-profit, non-governmental organization based in Beijing. GEI’s legacy and track-record supporting the Chinese government to improve regulations related to illegal trades and sustainable development make it a natural leader for this project, which involves expertise in conservation as well as in trade. GEI’s Executive Director, JIN Jiaman attended the event alongside GEI Executive Secretary JI Lin and GEI’s Marine Conservation Program Manager, WANG Jing. Of the seven species of sea turtles in the world, five are found in China’s seas. Sea turtles face critical environmental and human threats to the extent that the Convention on International Trade in Endangered Species (CITES) classifies them as Appendix 1 – the highest level of endangerment. In China, the main threats come from habitat destruction, illegal fishing, marine pollution and a strong illegal trade circuit at the border of China and Vietnam, as well as nearby Malaysia – Philippines – Indonesia Coral Triangle. China has taken steps to crack down on illegal trades on sea turtle products, including the “Hainan Provincial Ecological Protection and Construction Action Plan 2017-2020,” and establishing several preserved nesting sites in Hainan and Guangdong Provinces as well as Lantau. However, there is also a need to raise the public awareness of sea turtle conservation. Therefore, in addition to Mr. Liu’s work as Ambassador, the Alliance is also dedicated to hosting public education workshops and events, as well as working with tourism agencies, to ultimately reduce the demand that contributes to illegal trade. The Alliance’s work has already begun as they are tracking the migration and nesting patterns of the five turtles released on May 23 and are planning a public awareness event on June 8, World Environment Day. Ministry of Agriculture and Rural Fisheries and Fisheries Administration, National Wildlife Conservation Branch, China Academy of Fishery Sciences, Endangered Species Import and Export Management Office of the People’s Republic of China, State Customs Administration Anti-Smuggling Bureau, China Marine Police Bureau, State Market Supervision Administration, Director of Hainan Provincial Marine and Fisheries Department, Guangdong Provincial Marine and Fisheries Department, Fujian Provincial Marine and Fisheries Department, Guangxi Zhuang Autonomous Region Marine and Fisheries Department, Sanya Municipal People’s Government, and Sansha City People’s Government, Chinese actor Liu Yan and his wife Anna, as well as representatives from provincial-level fishery administration and conservation departments, scientific research institutes, members of China Sea Turtle Protection Alliance and media representatives. The GEI method is currently present in projects operating across 24 of China’s provinces and 10 of China’s closest international partners including Democratic Republic of Congo, Myanmar, Sri Lanka and the United States. In these areas, we have effectively lowered carbon emissions; protected thousands of hectares of land; worked with officials and experts; improved international environmental negotiations; and brightened the livelihoods of villagers for the long-term.